This is so easy snack that can be prepared at any time without prior planning. Ingredients are simple which we have in our pantry every time. This is how I make at home. 1. Heat oil in a frying pan or which ever you use for deep frying. 2. Meanwhile in a bowl mix the flours, salt, chilli powder, saunf seeds and chopped pudina and onions. 3. Heat the ghee and add it to this mixture. 4. Sprinkle some water and mix well so that it forms like bread crumbs, sprinkle some more water so that they binds slightly. 5. Drop into hot oil little by little, it need not be of same size. Deep fry until they are golden brown. 1.Oil should be very hot. For testing whether the oil has right temperature for deep frying put a little bit of mixture in oil so that it goes down and bumps up immediately and floats in the oil. If so oil has right temperature for frying. 2. 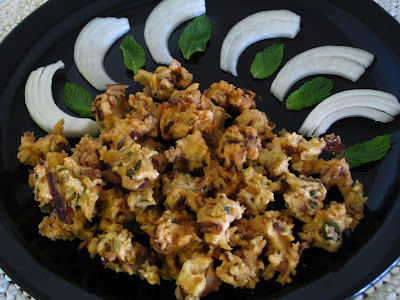 If you are doing more pakoras or pakodas mix the flour and divide them. Mix with water in batches for deep frying. 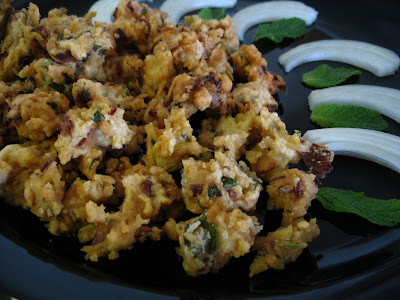 New pakodas for me.I make it with spinach,will try ur version. Nice pakodas! (crunch! munch!) Perfect for rainy days! You have a wonderful blog! Idyaappam, dosais and other recipes are lovely! You have a nice presentation. Thanks for visiting my blog. Thanks varunavi and usha !!! !